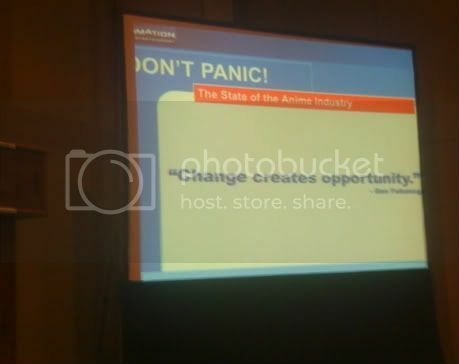 “DON’T PANIC!” reads the first slide of FUNimation’s powerpoint presentation at the New York Anime Festival, and once again, the audience lets out a nervous laugh. It is the same slide that the company has shown at the last Otakon, Anime Expo, and any other convention they have been to this season. It comes after a year in which fans saw the fall of two giants in the industry, Geneon and ADV. The company means to calm the worries of many fans about the future of anime in America. However, a single slide didn’t really bring that much reassurance, as the news seemed to continue to get worse as the summer rolled along. But things were a little different for this convention. Since Otakon, ICv2 had released a report on the current state of the anime industry, and it was revealed that FUNimation actually made up 32.7% – nearly a third – of the entire market. They were way ahead of the second largest company, VIZ Media, at 15.9%, the comatose ADV at 10.5%, Bandai Entertainment at 7.7%, and Media Blasters at 5%. FUNimation makes no effort in hiding this fact at their NYAF panel, and very quickly admit that they are probably doing much better than anyone else right now. But still, having them announcing that we should not worry about the state of the industry sounded a little cocky this time. Of course they aren’t worried about the industry! At a third of the market share, they are industry! What a huge power for one company to hold. But as the old Spiderman quote goes, with great power comes great responsibly. Instead of leaving the “Don’t Panic” statement at just that, FUNimation spent a little bit of time explaining their strategy for the future of the industry right there at the NYAF. And I have to admit, the optimism of this company finally convinced me the tide is just about to shift, and FUNimation is going to be the one to change it. 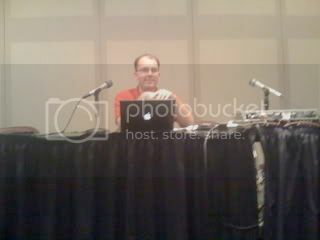 FUNimation rep Adam Sheehan heads up the panel. “Right now, the playing field of entertainment is totally changing, and we’re taking this as an opportunity to step up.” He cites that every studio, not just anime, is seeing a drop in DVD sales in the past year, and it is because everyone is switching to a new medium such as the high definition Blu-Ray disc or digital downloading. But even if the future is in these new mediums, they are not ready to give up on DVD just yet. After all, VHS stuck around for decades, so they believe that DVD still has plenty of time left in its life-cycle. But the current industry standard of releasing single volumes of around 4 episodes per disc is no longer working. So FUNimation is taking some initiative by releasing more new properties in multi-disc boxsets, much like how most domestic TV shows are currently released on DVD in America. “We want to give you more anime, faster, and at a lower cost because that is what everyone wants.” Even retail stores are having difficulty devoting the amount of shelf space needed to stock so many single volumes every week. So by foregoing the old model and releasing most of their new series as multi-disc boxsets, they are confident that it will benefit both customer’s budget and retailer’s shelf space. But even with DVD sales dwindling, FUNimation is well aware that anime fandom is still growing. Adam takes a little time to ask for everyone in the audience to raise their hand if this was the first time they have ever been at a convention. A significant amount of people raise their hand, and a small gasp is raised by the others. “Wow,” Adam remarks. “All of you older fans, please welcome these people because these are the fans that are going to keep it going.” He goes into how the fact that anime viewership is still increasing is a good sign that the market is still healthy, even if the new fans are watching their shows illegally. They just need to find a new way to capitalize on these new viewers. So FUNimation has hired a staff of fanboy marketers to aim their huge catalog at this growing yet untapped market. This is where digital distribution comes in, but that just doesn’t come that easily for any American anime company. Japanese property holders have always been reluctant to change their distribution system. As much as FUNimation wants to get into the digital space, if they cannot get the cooperation of the Japanese, they can’t really do that much. But with the help of the open minded Japanese studio Gonzo, FUNimation became the first company to put anime on iTunes about 20 months ago. They found the pay-per-download marketplace to be very profitable, and quickly moved into new services like the Xbox Live Marketplace, Amazon Unbox, and the Playstation Store. The company created a new policy – they would not license any show unless they received the complete cooperation from the Japanese to go digital with their product. But this still wasn’t winning over that fansub audience, so FUNimation recently turned their attention to free streaming video services. First on their list was a little video sharing site Youtube. “You guys have heard of Youtube, right?” Adam jokes with the crowd. FUNimation had started posting the first few episodes of several of their series on Youtube in order to allow their fans to sample a series before committing to buy it. I had discovered this service in the final day of my Living Legit experiment in July, and the company has been consistently adding new episodes to Youtube since then. But in the weeks leading up to NYAF, FUNimation had venture into even new territory by striking a deal with Hulu and Joost to post entire series on those sites. With all these new options, they are expanding just as quickly into the free streaming market as they had done in the pay-for-download market. The tone in Adam’s voice gets a little sad over this last line, and I believe that it is because no matter how hard FUNimation is trying to win over fansub watchers, there is still a huge flaw in this strategy. The most important reason why this audience turns to illegal anime is the cost. Everyone wants to watch their shows for free, but unfortunately, it costs money to create anime. So FUNimation is remedying this by putting their shows for free on these ad supported streaming video services. But the flaw is that these titles have all been circulating on the internet prior to FUNimation’s licensing of them. 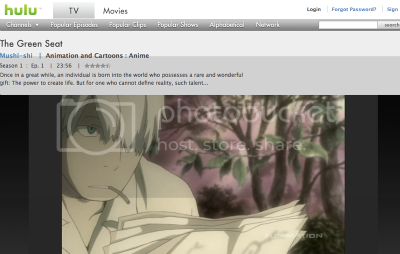 Mushi-shi is now available for free on Hulu, but the fansub audience had already watched it when it was aired on Japanese TV three years ago. As much as FUNi fights to get the show legally online for free, they are not going to win over the audience simply because they are not the first to hit the internet. And unfortunately, this was something that was still beyond the company’s control at the time. But that was three weeks ago, and the outlook has once again changed for FUNimation. Early this week, they announced that starting this Friday, they will be adding a subtitled version of Shikabane Hime to their free streaming outlets and pay-per-download service. This show is currently airing in Japan, and the episode premiering this week just aired on Japanese TV three weeks ago. This is catching up with a strategy that Gonzo had independently started last spring, which so far appears to have been successful for the Japanese company. FUNimation might not the first to do a near-simultaneous release like this, but I feel that they have the power and motivation to drive it home and really win over that untapped audience. Quite frankly, FUNimation is doing everything the right way right now. Sure, they’re not able to fansub problem all by themselves, they simply can’t. But man, they sure are trying. They are using their weight over here in America to change the way things are in Japan. If a third of the American market is telling you that you must give them digital distribution rights, then you have no choice but to give it to them. If a third of the American market is telling you to get your stuff on Hulu as soon as possible, then you better take their advice and get your stuff on Hulu. If a third of the American market is telling you to change, then you probably should change. If this isn’t the great compromise that is going to win over the fansubbers and yield the next evolution in the US anime market, then it is sure as hell is the sign that it is coming around the corner. But can it really work? The thing about a compromise is that both parties have to give a little to make it work. FUNimation doesn’t have to cater to the fansub audience, because these fans are not currently contributing to the industry. This company could just rely on the small fanbase still buying highly mainstream titles like Afro Samurai and DBZ, and that alone has earned them a third of the market share. But FUNimation is motivated in winning over all the fans, and they are working their asses off to force the Japanese to open up to this new market. And every week, they come closer to reaching their end of the bargain. So now it’s up to the fans to live up to their end of the bargain. While ideally FUNimation wants the fans to buy an expensive collectible DVD, they realize that most fans aren’t going to. So they are putting together cheaper boxsets for those who are still willing to pay, and streaming shows for free for fans who don’t want to pay. Will the fans settle for watching it with some ads on Hulu when they can just pirated it ad-free? Likewise, the Japanese do not have enough time to translate and attach English subtitles to every new episode when they are worried about making the deadline for TV broadcast. That raw will probably hit the internet before FUNimation can obtain the episode and finish subtitling it. Will the fans be willing to wait a week or two for it to show up on Hulu when the illegal version is already available? The optimism of FUNimation Entertainment believes that if they are willing to pressure enough change from the Japanese, then yes, the American fans will also be willing to compromise. To them, that it is the bright future of an industry in a panic right now. And with every passing week, they are coming closer and closer to their goal. This entry was posted on Wednesday, October 22nd, 2008 at 7:11 pm by Scott	.